Solomon had a weakness — women. He married foreign women against God’s commands (700 total and 300 concubines). As he grew older, his wives turned his heart to other gods and his heart was not fully devoted to God like David’s was. He did evil in the eyes of the Lord, built shrines to foreign gods to appease his wives, and encouraged the Israelites to follow these gods. 3) Solomon worshipped other gods, made treaties with pagans, made cast idols, and married foreign women. He acquired large amounts of horses and accumulated large amounts of silver and gold. 4) Marriage is a sacred institution, designed by God, for His glory, meant to be between one man and one woman. 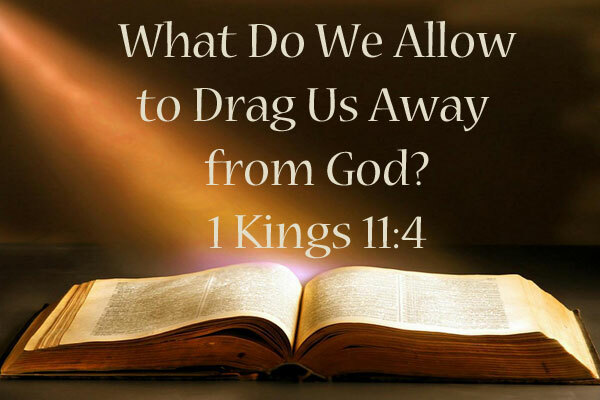 He tells us not to marry unbelievers (foreigners at the time of Solomon) because they can unduly influence us, corrupt our hearts, and turn us from Him. This is for our good; otherwise, we can stray from God and never return, and we can influence our children and those around us to do the same. 5) Personal Question. My answer: I don’t do it. It’s not that simple, but it can be. I try to live a Godly life and be close to God. With that, I rely on the Holy Spirit and prayer to guide me to make good decisions. Sometimes I don’t and, luckily, God forgives. Solomon is a good example of just how powerful those around us can be. Parents are correct to monitor who their children hang out with. We all need to be aware of those around us and surround us with Godly people who lift us up in this broken world. For all of Solomon’s wisdom, he messes this one up big time. Solomon loved these women more than he loved God. Why did Solomon have so many wives? Solomon married for political power and influence. Solomon married to show the world how wealthy he was. In ancient times, a large harem was a status symbol, announcing to the world how many women you can support and have dominion over with your wealth. Solomon married because of his lust for women (or worldly things women brought him). This is an almost unbelievable number of marriage partners. His wives were considered princesses, but his concubines were legal partners without the same standing as wives. All said, Solomon had far more marriage partners than any man could possibly give attention to. Many prominent men in the Old Testament had concubines. Examples include Abraham (Genesis 25:6), Jacob (Genesis 35:22), Caleb (1 Chronicles 2:46), Saul (2 Samuel 3:7), David (2 Samuel 5:13), and Rehoboam (2 Chronicles 11:21). Significantly, the Bible never shows this kind of family life blessed by God. If one wife is not enough to satisfy a man, then 1,000 wives will not be enough. When a man is unsatisfied with the woman God gave to him, the problem is with him, not with his wife. Solomon should have listened to Proverbs 27:20: Hell and Destruction are never full; so the eyes of man are never satisfied. Solomon’s desire for worldly prestige led him to ungodly marriages. Based upon the Song of Solomon, Solomon seemed to know what true love was with one woman. We don’t know when Solomon added his second wife. When he did, it was easy for him to rationalize it – after all, the greatest King of Israel, his father David, had several wives and concubines. Once he began, (Matthew 19:4-6 and Genesis 2:23-24), it was easy for him to keep adding wives, breaking God’s commandment in Deuteronomy 17:17: Neither shall he multiply wives for himself, lest his heart turn away. Age did not make Solomon wiser. Age and experience should make us more godly and wise, but they do not automatically do so. His heart was not loyal to the LORD his God: Solomon is a contrast to those who did fully follow the LORD. This phrase is used in a positive sense of three men in the Old Testament: Joshua and Caleb (Numbers 32:11-12, Deuteronomy 1:36, Joshua 14:8-9, 14), and here of David. Solomon had more than one wife and David had more than one wife (fifteen, according to 1 Chronicles 3:1-9). David spiritually survived this failing, while Solomon did not. David was probably not yet in heaven (Luke 16:19-31), but in a place of blessing and comfort known as Abraham’s bosom. If it were possible for someone in Abraham’s bosom to see life on the earth and be sorry, David was very sorry when he saw Solomon and his sin. David no doubt hoped that his children would be better than he, and find more victory in the areas of life that troubled him. Sadly, David’s sons found less victory in controlling the lust of the flesh, and especially sexual lust. Yet David’s sin did not turn his heart away from the LORD. It is possible for a particular sin in one person to be a hindrance to someone else’s life. David’s lack of romantic and sexual restraint hindered him; it destroyed Solomon. This is one reason why we must be so careful with the sin of stumbling another brother or sister (Romans 14, 1 Corinthians 8). Probably Solomon did not see his building of altars to other gods as a denial of the Lord God of Israel. In his mind, he probably thought that he still honored the LORD; he simply added the honor of these other gods to his honor of the LORD. But this is never acceptable to God. He demands to be the only God in our life. Because of lust, Solomon found himself in a place where he never thought he would find himself. He found himself burning incense at the altars of depraved pagan gods and at the altar of child sacrifice unto the god Molech. This is the power of sin – it can capture us in a spell, in a fog of spiritual confusion until we do things we never thought we would do. If this was the case with the wisest man who ever lived, then what hope do you have apart from constant dependence upon Jesus Christ? Let the example of Solomon drive you to greater dependence upon and abiding with Jesus.